Continuing the discussion from a couple of weeks back about what makes a great RustyButTrusty car, we should also consider that what a car is missing can mean just as much as what it has. No b-pillars? Check! Fewer than 4 wheels? Check! Fewer than 4 cylinders? Check! No b-pillars, c-pillars, windows, roof, doors, or carpet, and only 2 cylinders? Overload! 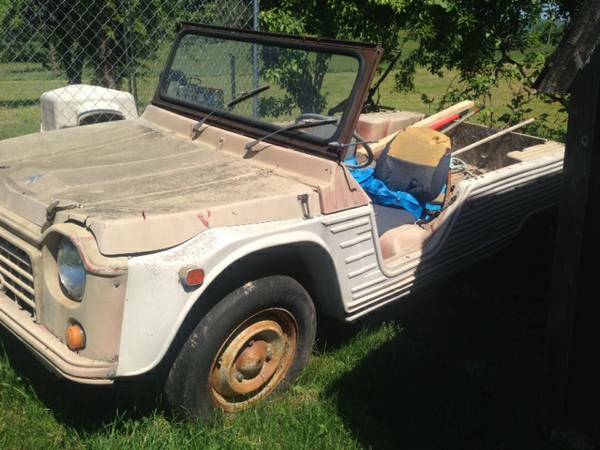 Check out this 1970 Citroen Mehari for sale for $2500 in Dayton, VA. So it’s not much to look at, but this is said to be one of the US Meharis finished in red plastic, now faded even beyond pink. 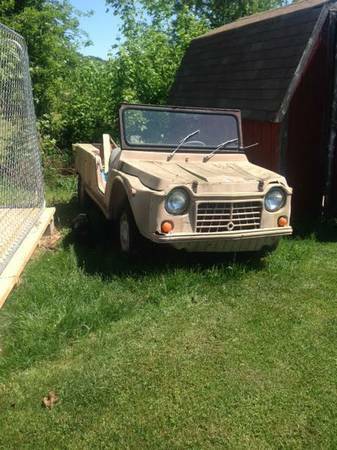 It’s said to run very well, and is missing its roof, doors, and side panels. It’s not clear what’s in the back of the car, but it’s not likely to be the top frame based on the seller’s description of the car. Seats were missing when the seller purchased the car, so he installed some foam desk chairs. Sadly, the original equipment (to the desk chairs) rubberized armrests were not retained, and the fabric upholstery seems to be peeling off. The great news is that for about $1000 you can get a full set of new seats – frames, upholstery, padding, and hardware. And for another $1000, you can get a full top, side panels and doors, and about $450 for a set of tires. Or you can forget all that, enjoy the car for what it doesn’t have, and run it as-is. This entry was posted on June 10, 2014 at 2:49 pm and is filed under Feature. You can follow any responses to this entry through the RSS 2.0 feed. You can leave a response, or trackback from your own site. I’ll bet that plastic body is as brittle as eggshells. That fits in really well with the whole minimalist approach of this car – soon, you can have no body either.